2014-UP 5'' Side angled cut design gives you the ultimate look while providing maximum cornering clearance. Each saddlebag is stretched 5in longer than stock to cover your muffler from front to back and provide a stretched look. These injected molded ABS saddlebags provide consistent quality, superior strength and rigidity. Perfect fit every time from a name you can trust. Saddlebags have cutouts for dual exhaust applications. 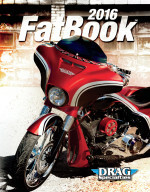 All of Milwaukee Bagger fenders & fender extensions will match up.